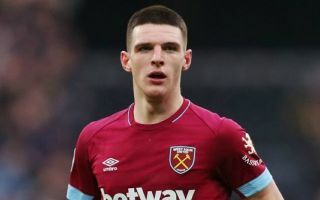 West Ham United ace Declan Rice has been forced to apologise after pro-IRA messages he posted in 2015 have surfaced. The 20-year-old could be in line to make his England debut on Friday against the Czech Republic at Wembley, but he has had to deal with past comments coming to light this week to disrupt preparations. “I am aware that a poorly-expressed comment I made when I was a junior player has been circulated on social media,” he said, as quoted by Sky Sports. “I recognise now that my attempt to show support for my team-mates at the time could be negatively interpreted. Sky Sports add that the youngster isn’t expected to face any disciplinary action from the FA, but he has been ‘reminded of his responsibilities’. His comment can be seen in the image below, as well as his Instagram post apologising for it. On one hand it could be considered naive and reckless from a youngster, but perhaps others will take a more serious stance on the matter. Either way, the FA aren’t expected to now take any action, perhaps leaving Rice free to make his England debut this week after switching allegiance from Ireland last month.